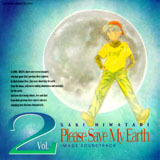 There is more good music in Please Save My Earth than will fit on a single CD. As far as I know, there are 3 soundtrack CDs and 3 drama CDs, plus a domestic version as well. Overall, I would rate soundtracks 1 and 3 as being tied for the best. Personally, I don't like the tracks on soundtrack 2 as much, although there are some good pieces, as well as one or two drama tracks, if I remember right. The first drama CD is also quite good, and I currently don't know anything about the other two drama CDs. A quick search of a number of sites couldn't turn up the CDs at all, so I'm guessing it's out of print here in the US. 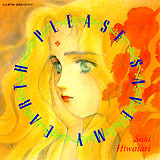 However, you can order the import versions of the CDs from Nikaku Animart or Mikado in San Francisco. 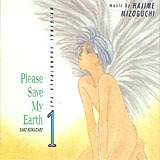 Although there are three soundtrack CDs, most of the important and truly good compositions can be found on the first one. This includes the end theme song, "Memories of the Times," as well as the long version of "In the Bed of the Crescent Moonlight". This CD has 25 tracks and is over 60 minutes long. Other selections include "Parallel View," the light, comical piece that's played when Rin first kisses Alice, and "The Scent of Tragedy." If you are interested in getting this, it is put out by Victor Entertainment. The part number is VICL-446. There is also an SM version of this available, and though I personally don't agree with buying the SM-manufactured CDs, I can understand that some people will have more of a restriction on their spending than I might. Here is the play list for the first soundtrack, as near as I can translate them. Please note that I couldn't find some of the words in my puny dictionaries, so a few titles are incomplete. I've also included the romanized Japanese names as well as I could handle them. This is the piece that plays at the beginning of episode 1 when Alice thinks to herself "I want to go back." Can't remember when this is played. When Shion first meets Kyaa! Of the three purely musical soundtrack CDs, the second is probably the worst. Although it contains some decent pieces, not too many of the tracks really stand out. One, about Mikuro as a kid, is fairly nice. And the track where Issei meets Jinpachi at the public baths, gets embarrassed, and almost drowns is pretty funny. Unfortunately, "Young Soul Rebel" where Jinpachi and Issei rap is awful. If you really want a complete collection, then get it. Otherwise, get the other CDs. The part number is VICL-519. The play list for the second soundtrack, to the best of my ability. I've also included some notes on which composer did which songs, where I could decipher the names. Aside from the first CD, this one, "The Golden Age, The Festival from the Moon," is the best other one. Some of my friends like it even more than the first one. The first track of 16 is "The Passing of the Golden Age," (also called The Time of Gold Flowing on the domestic version) the song that begins the Image Music Video. This is a really nice song, presumably sung in the alien language of Mokulen's home planet. At least, it doesn't sound like any language that I can tell. Track number 5, whose title is something like "The Song You Don't Sing" (JVC titles it Song Without A Song) is a very odd one that changes from quiet to a driving sound and back, but I personally like it a lot. 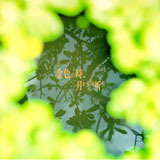 Track 7, "Injured Wings, " (JVC: Wounded Wings) is the extremely powerful and moving music used during the final fight sequence between Rin and Mikuro. Track 10 is again from the Music Video. This one is called "Ring," the English name used for Rin in the manga. It includes more of the alien singing from the first song, as well as English commands that (I think) Rin is giving the computer in the moon base. If you liked the Music Video, then you'll probably like this one. The part number is VICL-5260. The play list for Image Soundtrack #3, taken from the domestic JVC version, follows. Much thanks to George Batey for sending me this list! 4. Edge of Dreams, Tears? In addition to the soundtrack CDs, there are also a number of drama CDs for PSME. The first of these, "Moon Wave," contains minor bits of repeated material from the show, plus a great deal of information that is not shown in the episodes. For example, the first drama track is from Shukaido's diary, in which he writes that he's always had an attraction to ZKK-101 (the Moon). He also mentions that Shion has always been a loner. From this, the CD continues onto tracks that detail the group's first meeting on their home planet; everyone's reaction to Mokulen (the men are immediately struck by something about her, although they don't know what); various talks and arguments the seven have on the Moon. One track explains why there are so many plants in the moon base: when Mokulen was depressed, she sang to the plants, which began to overgrow every part of the station. Another part of the CD details the fact that most of the equipment on the base is antiquated; this may explain why the group was not prepared with vaccines and good medication. Lastly, a couple of the tracks talk about Shion, Gyokulan, and Shukaido's early days together in school, and where the rivalry between Gyoku and Shion began: over a girl named Koko. Although the drama CDs aren't for everyone, they still have a good amount of the extremely good music on them. Even if you don't understand Japanese (and can't find someone who does), you may still be interested in these. The part number for this one is VICL-444.